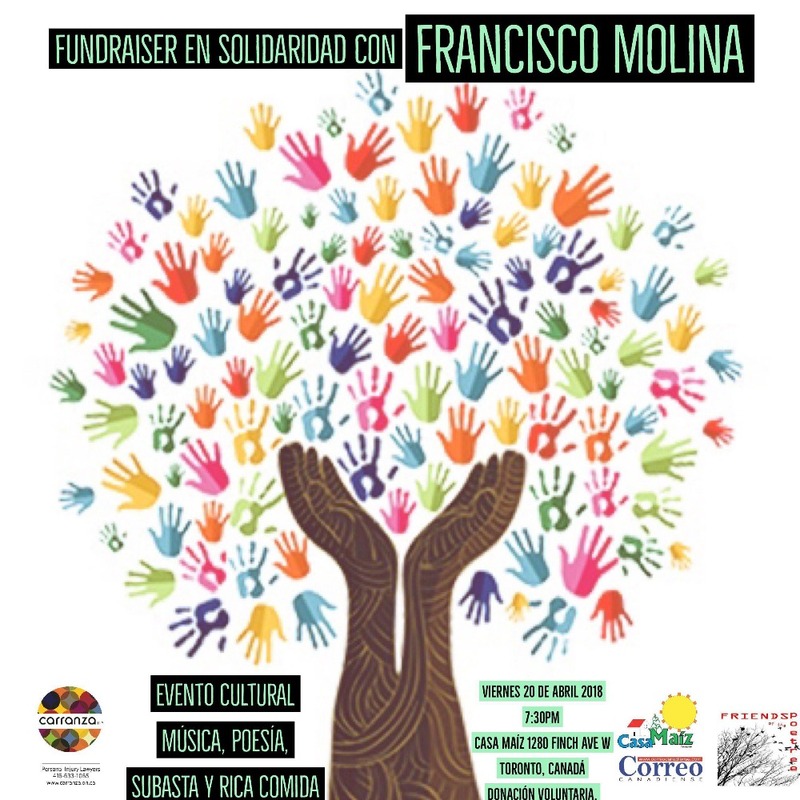 Francisco Molina needs our help. Francisco is home now, but he is recovering from a brain injury. He sometimes has intense headaches, fever, confusion or trouble remembering. He has had a seizure. He cannot see very well with his left eye. Three days after the incident, Francisco was informed by his employer, the Bloor Information and Life Skills Centre, where he has worked for 7 years in the newcomer settlement and pre-senior programs, that the organization will be closing and that all staff will be laid off because its service agreement with the United Way is not going to be renewed (and this source constitutes 90% of its funding). So, Francisco is now out of a job. Francisco is in a precarious financial situation. What he needs right now is help to make ends meet during this recovery period. He needs time to adjust to his new physical realities as well as to deal with the emotional trauma. But, ultimately, what he wants is to get back to work. 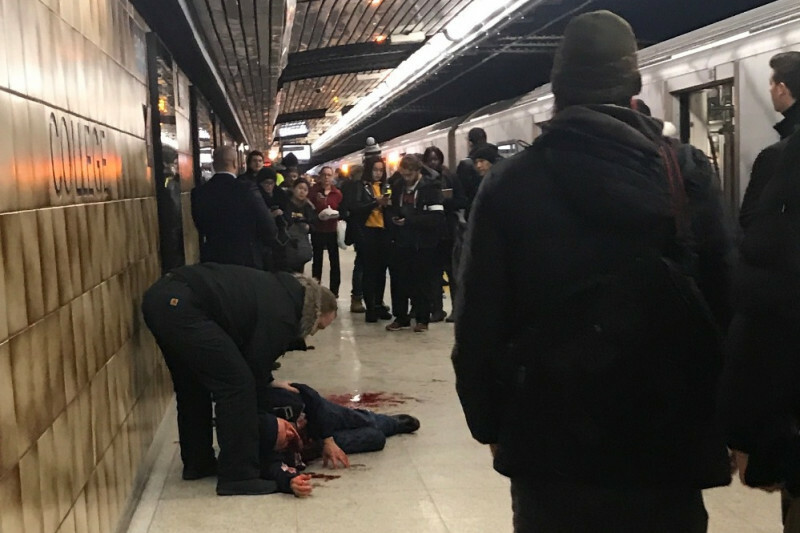 I met Francisco for the first time on that subway platform, but since then I've had the pleasure of getting to know him personally and meeting some of the people whose lives he has touched. He has always done community work - most recently with Spanish-speaking seniors and newcomers, but before that with young offenders at Operation Spring Board, and before that with homeless men at the Scott Mission. 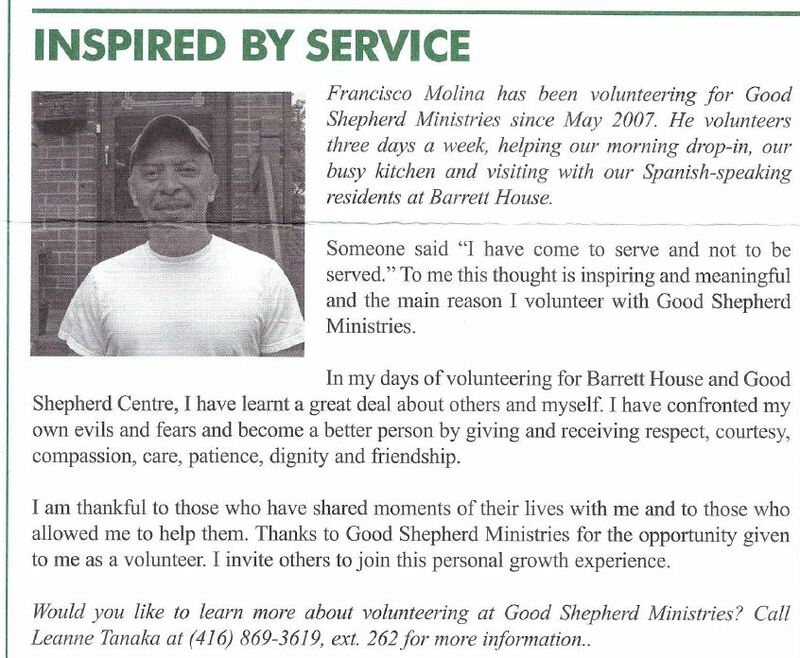 He has been recognized for his volunteerism at the Good Shepherd Ministries (see below) and elsewhere. Before he came to Canada, he was an elementary school teacher in El Salvador, but had to leave when his life was in danger due to the political climate. Francisco is a good and decent man who is facing hard times right now through no fault of his own. I am hoping that people in the community will see the value in supporting this lovely human being. 100% of the proceeds of this campaign will go directly to Francisco. 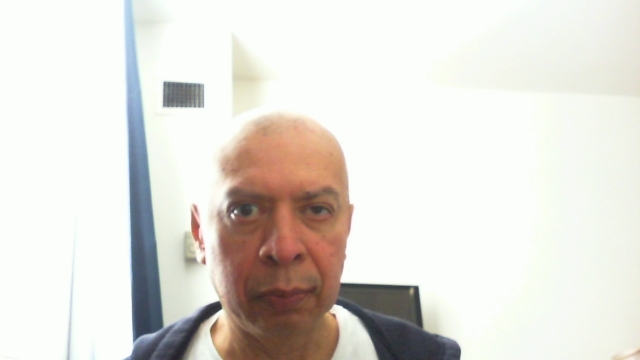 Moreover, Francisco will be looking for employment in Toronto, Ontario preferrably in the social services sector. Please contact me if you have opportunities that you would like to bring to his attention. "I want to thank all the people who in one way or another have supported me in this ordeal through prayers, donations or good thoughts. Special thanks to the urban angels who were by my side the day I was attacked, they were the ones who kept me safe and warm, who worried about my survival until the paramedics arrived. My gratitude to the paramedics, and to the medical staff and workers of the Saint Michael Hospital." Tomorrow's Toronto Sun will be covering the story about Francisco's recovery and the GoFundMe campaign. Thank you so much for you're support. I'm convinced we can get 1,000 people to donate $25 each. We're already almost one fifth of the way to our goal. A message from Francisco: "I think the money donated by the good souls is a lot of money. Even 5 cents would mean a lot to me, not because of the money but because the good will in each of those people who are trying to help me. May the divine spirit bless them!" Thank you for your support!